The joy of seeing digital games on Steam priced in Singapore dollars has been short-lived. 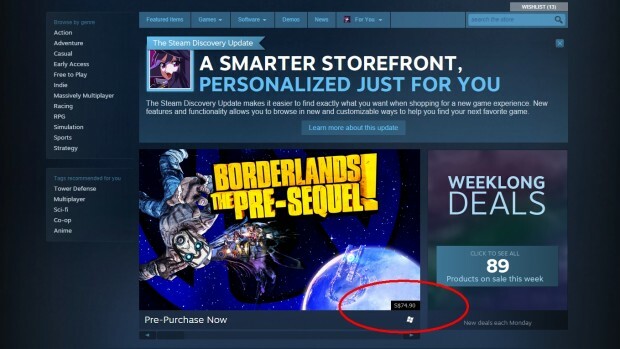 As reported by Straits Times Digital Life, some games on the Singapore Steam store have reverted back to their equivalent US pricing in Singapore dollars. Borderlands: The Pre-Sequel!, published by 2K Games, was previously priced at S$55 two weeks ago when the Singapore currency switch was first made. It is now priced at S$74 (!! ), matching the US store’s price of US$59. Basketball game NBA 2K15, also published by 2K Games, has also undergone the same treatment. It is now priced at S$74, up from its old Singapore price of S$55. The changes came after publishers and retailers, unhappy with the disparity in pricing, complained to Steam. They were aware of the switch to local currency, but did not expect the prices to be lower than retail pricing – what customers would pay at a physical store. I would like to know exactly who these retailers and publishers are, because it highlights the brainless Singaporean mentality of complain, complain. Digital videogames will always be cheaper than retail, because the middlemen are eliminated from the equation – no distributor, no retail shop, less people wanting a cut of the money. Having the Steam prices reverted back to the US pricing is highly unlikely to boost the sales of your retail game. This is an argument for another day, however. Fortunately, not all Steam games have reverted their prices. Two upcoming October 2014 releases, The Evil Within and Alien: Isolation, have remained unchanged at S$55 and S$49 respectively… although this could change at any moment should their Singapore publishers also decide to complain to Steam. I did a quick price check for other digital-only games, and they remain unaffected. Sleeper hit Divinity: Original Sin, released in July 2014, is still priced at S$39.00. Transistor, another popular digital indie hit, remains untouched at S$20. We can therefore assume that only the popular retail titles helmed by big-name publishers will be affected by this price change. If you are a gamer who prefers playing indies and lesser-known digital games, you’re still safe. And if you are not, you can always wait for the inevitable Steam holiday sale.